This entry was posted in facts and figures news and tagged MINI UK Plant Oxford on April 26, 2016 by James Day. 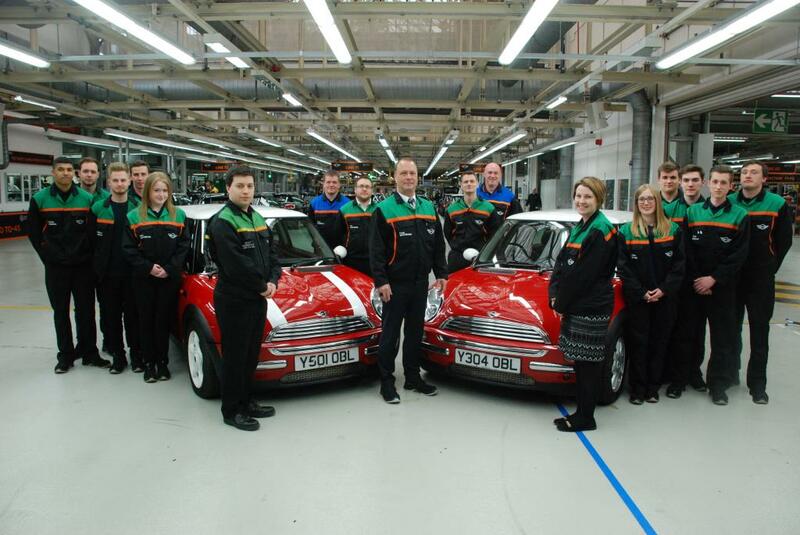 Plant Oxford today celebrates 15 years since the first new MINIs rolled off the production line on 26 April, 2001. The BMW Group, which is marking its centenary year in 2016, acquired the plant in 1994 and relaunched the brand in 2001 with the debut of the new MINI Hatch. Since then more than 2.5 million MINIs have been produced in Oxford, with the three million milestone expected to be hit later this year. 80 per cent of the cars made here are exported to more than 110 countries around the world. The 2001 MINI launch was the reinvention of a British motoring icon, which generated headlines around the world. As well as making the news, the car was subsequently recognised with several industry awards after it went on sale. This included being voted ‘Car of the Year’ in 2001 by leading UK weekly car magazine, Auto Express. Impressed by the car’s driving abilities, quality levels and safety features, the magazine praised the fact that the classic Mini’s DNA was “unmistakable” in the new car. Sales of MINI, both in the UK and internationally, have gone from strength to strength over the last 15 years. In its first year nearly 40,000 MINIs were sold worldwide. By 2015 this number had risen to nearly 340,000, with more than 63,000 sold to customers in the UK – the highest since the brand’s relaunch. The plant’s automotive history dates back to 1913 when the great designer, entrepreneur and philanthropist William Morris (later Lord Nuffield), produced its first car, a “Bullnose” Morris, near today’s present state-of-the-art MINI production facility. The classic Mini was produced at Oxford from 1959 until 1968 with a peak output of 94,889 cars during 1966/67. Today, more than 4,500 people are employed at the site in Cowley, which manufactures around 1,000 cars a day, including three and five door MINIs, the MINI Clubman and its first all-wheel drive All4 model – and the high-performance MINI John Cooper Works. Three UK plants have had a part to play in MINI production – Hams Hall near Birmingham makes engines, Swindon produces body pressings and sub-assemblies for MINI, and this all comes together at Oxford with body shell production, paint and final assembly. Together these plants have helped to generate and sustain employment for thousands of people directly and indirectly though the wider supply chain and retailers. Between 2012 and 2015 BMW Group invested £750 million at the plants, taking investment in UK production to £1.75 billion since 2000. At Oxford this has included a state-of-the-art paintshop, a high-technology body building facility, a new final assembly area, a new logistics centre, Quality and Engineering Centre and the MINIcademy, where the plant’s apprentices are trained. Joining Technician Chris Wherritt is one of 22 current plant associates who began their careers as apprentices in 2001. The first MINIs – which were registered with ‘Y’ prefixed number plates – are now considered by many enthusiasts and fans of the brand to be modern classics. MINI enthusiast Tanya Field, whose husband Jason works at the plant in IT, is working to set up a new club – Y REGister – to bring together owners of MINIs made in Oxford in 2001. MINI is the only car in the segment that offers Head Up Display, which projects important information into the driver’s line of vision, thus eliminating the need to take their eyes off the road. The John Cooper Works Hatch has the best power to weight ratio in the segment as well as the highest top speed and the best acceleration of a non 4-wheel drive car in the segment. MINI Cooper D is the fastest accelerating car to be sub 100kg / km in the segment. MINI Touch Controller enables users to draw in postcodes using their fingertips. This entry was posted in facts and figures and tagged pricing on October 13, 2015 by James Day. MINI has released all of the 2016 model prices and we have compiled the MINI model pricing figures in the US since the launch in March 2002. The prices include the Destination and Handling Fee shown. There was a mid-year price increase in 2004 (as shown in the table). 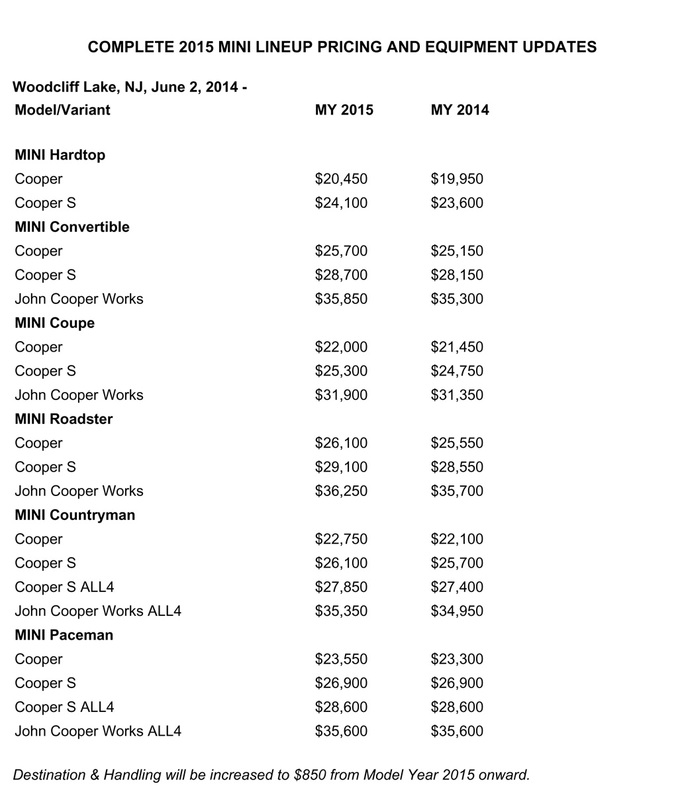 Since MY2011, the MINI Cooper Hardtop ($20,100) is more expensive than the MY2002 MINI Cooper S Hardtop ($19,850). The only price that went down from the previous year was the 2010 MINI John Cooper Works Convertible (from $34,950 to $34,700). Prices remained the same from 2007 to 2008 and from 2015 to 2016. The highest ever base price is for the 2015 MINI John Cooper Works Roadster at $37,100. The 2013 and 2014 MINI Cooper Clubvan was priced at $25,985 before the D&H Fee (which increased from $700 to $795 on May 1, 2013). This entry was posted in facts and figures news and tagged pricing on June 11, 2014 by James Day. Days away from ordering availability and weeks away from the start of production of the 2015 model year, MINI USA released prices for the entire line-up. Rain Sensor & Automatic Climate Control are now standard for all models. Ice Blue, Oxford Green, Royal Grey, and True Blue are no longer available. 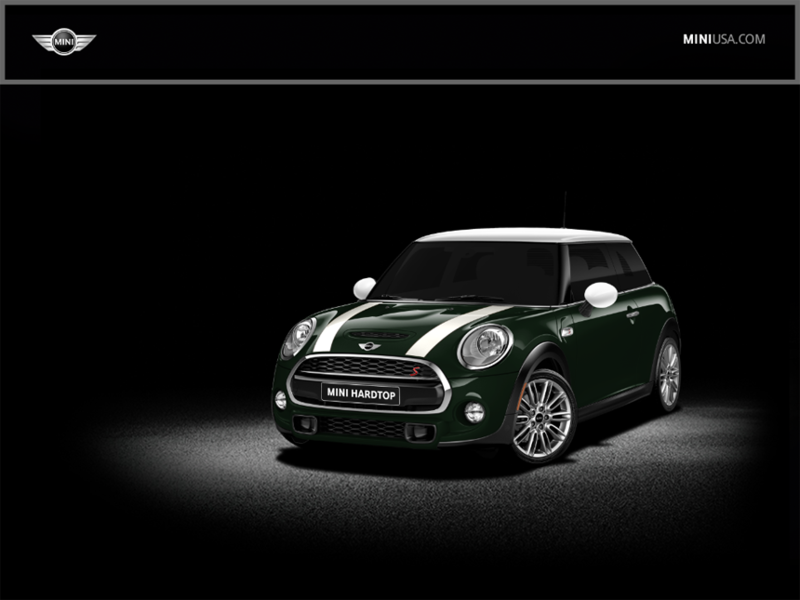 New colors are Jungle Green and Midnight Gray, available on the Countryman. Starlight Blue is now available on the Countryman. ALL4 Exterior Styling option is new for the Countryman for $500. The side scuttles, front headlights, rear taillight surrounds and roof rails are now available in Piano Black gloss on the Countryman and Paceman for an additional $250. The 17” 5-Star Triangle Spoke Silver wheels are now standard on the Cooper and Cooper S Countryman and Paceman. The 17” 5-Star Double Spoke wheels are discontinued. MINI Yours Vanity Spoke 2-tone wheels are now offered for the Cooper ($2,000) and Cooper S ($1,500). Vehicles with either screen (8.8” or 6.5”) will be required to take Rear-view Camera and Park Distance Control as well. 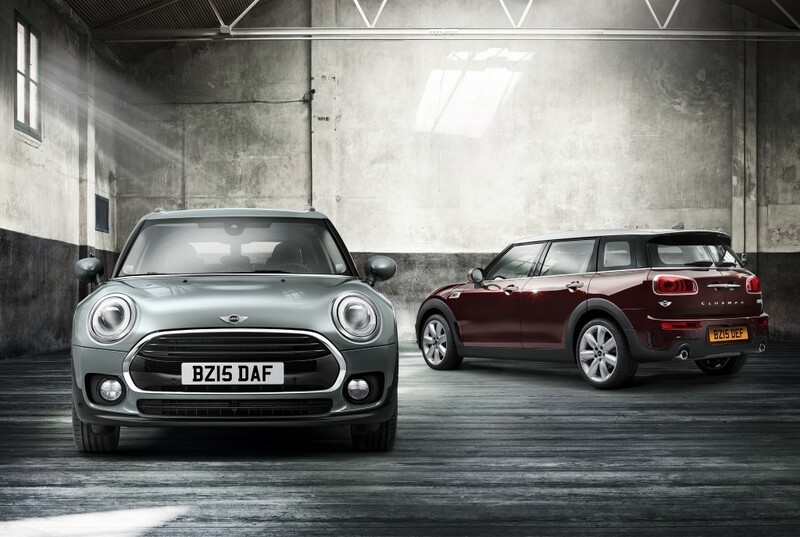 Download the complete MINI Pricing 2015 (PDF). This entry was posted in facts and figures news and tagged wheels on April 19, 2014 by James Day. View our MINI Wheel Guide updated for 2014. This entry was posted in facts and figures and tagged pricing on February 6, 2014 by James Day. With MINI moving into its third generation starting with the 2014 MINI Hardtop, we have compiled the MINI model pricing figures in the US since the launch in March 2002. The prices shown are the Manufacturer’s Suggested Retail Price (MSRP) which includes the Destination and Handling Fee shown. Prices remained the same from 2007 to 2008. The highest ever base price is for the 2013 and 2014 MINI John Cooper Works Roadster at $36,495. This entry was posted in facts and figures news and tagged MINI Hardtop MINI USA pricing on January 31, 2014 by James Day. After announcing the pricing of the 2014 MINI Cooper and MINI Cooper S Hardtop yesterday, MINI USA released the full options and pricing sheets. Download from MINI USA NEWS: MINI Pricing Guide: F56 HARDTOP (PDF). This entry was posted in facts and figures production and sales and tagged MINI USA sales on January 27, 2014 by James Day. 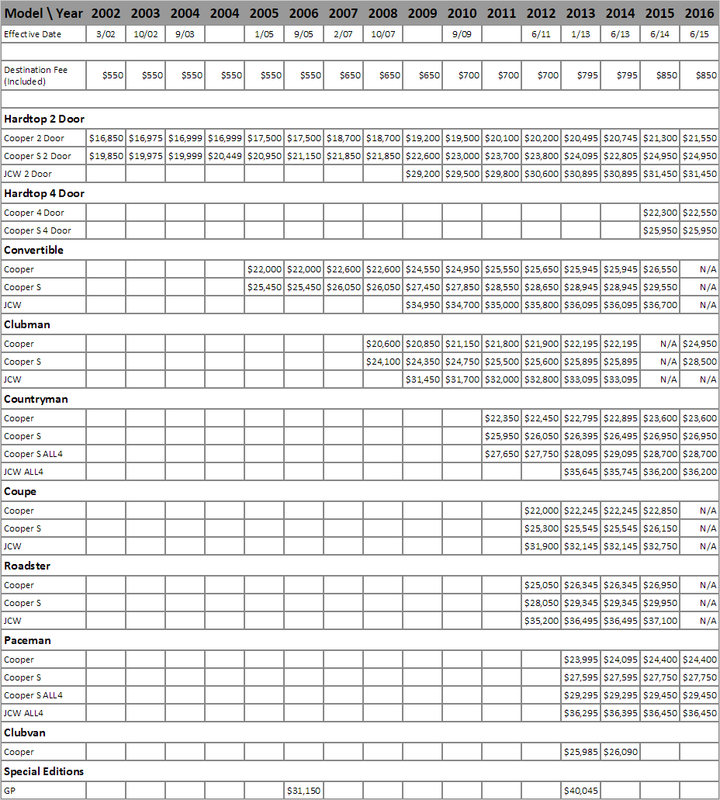 Now that MINI USA has released its sales figures for 2013, let’s look at the yearly sales since the launch in 2002. MINI USA had its best sales figures ever in 2013, just barely beating the previous year’s record sales by less than 1%. Annual sales in the US have risen steadily since launch with only two years having declines in sales: -4.0% in 2006 (the last year of the first generation) and -16.4% more recently in 2009 due mainly to the poor economy. 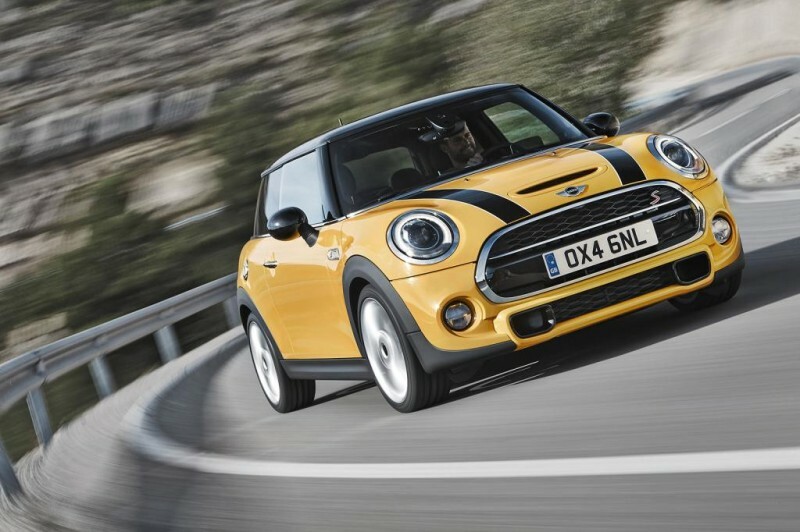 Sales have increased for the past four years as the economy has improved and MINI has launched more models. The MINI Countryman sales figures have been strong, but it’s unclear how many sales of other models it cannibalized, especially those of the MINI Clubman. With the model changeover, the production delay of the third-generation Hardtop, and the lack of a MINI John Cooper Works Hardtop in the lineup, MINI USA will be hard-pressed to top its 2013 sales figures. In the twelve model years since the MINI USA launch on March 22, 2002, MINI has sold 553,750 vehicles. Tomorrow we will have MINI USA sales figures by model (body style). This entry was posted in facts and figures news and tagged BMW MINI Hardtop on December 5, 2013 by James Day. MINI has always been known for its bulldog stance with its wheels pushed out to the corners of the car. Since the early spy photos of the third-generation MINI Hardtop (F56), there has been much discussion about the growth of the model, especially with the front overhang. The longer overhang and the height of the bonnet have grown to meet European pedestrian safety standards. MINI acknowledges that the new Hardtop’s front overhang has grown but that it is still much shorter than its competitors. But how does it compare to BMW’s own 1-Series? Comparing the published specifications for the current BMW 1-Series Coupe with those of the 2014 MINI Hardtop, we find something surprising. The MINI Cooper’s front overhang is 749 mm, which is only 2 mm shorter than the 1-Series’ front overhang of 751 mm. However, the longer 757 mm front overhang of the MINI Cooper S is actually 6 mm longer than the BMW’s. We’ll have more on the MINI Hardtop dimensions and specifications soon.